In the eastern flanks of Mt. Olympus it’s Greece’s first national park, created in the 1930s, with no roads within it apart from the trailhead access road. There is also no habitation apart from the two shelters, which bring together groups of mountaineers from across the globe in their cozy and homey atmosphere. 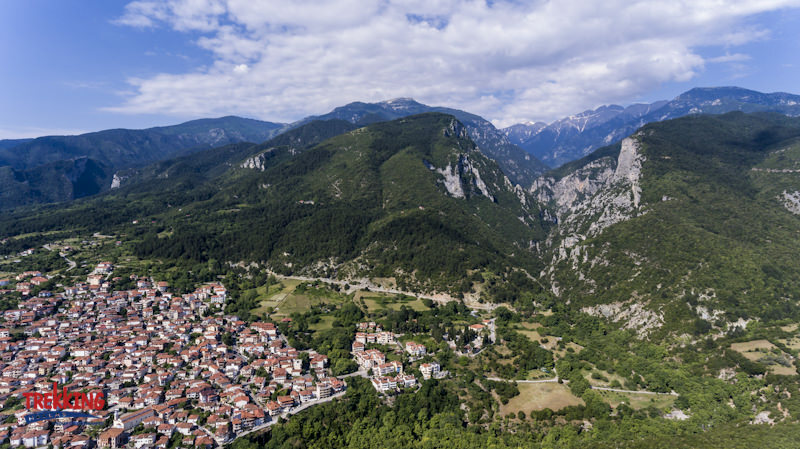 The mountain’s watershed divides the regions of Thessaly (south) and Macedonia (north); east is the Aegean Sea, which brings in the afternoon/evening mist so characteristic of this mountain. A monumental natural landscape with thickly forested slopes and steep rocky foggy and cloud-covered peaks, hosting more than 1500 plant species, some of them rare and endemic, as well as wolves, jackals, deers and some endangered bird and butterfly species. As Mt. 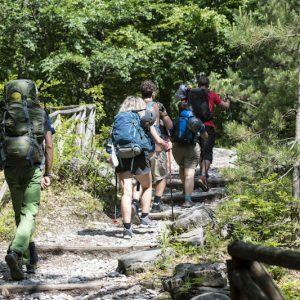 Olympus is a challenging walk and the safety of our fellow travelers always comes first, our guides retain the decision if we actually climb the peak of Mytikas. This will depend on both the travelers’ abilities and weather conditions. In case of snow, the ascent to Mytikas is not possible. The program begins and ends in the village of Litochoro in the foothills of Mt. Olympus. In case you are flying to Greece, we recommend flying to Thessaloniki airport (Greece’s second biggest town) from where the trip to Litochoro is about 1,5 hours. In case you fly to Athens, the trip is about 6 hours long and we recommend traveling one day before and spending a night in Litochoro. In case you need assistance with hotel bookings or other services please contact us. In this trip we walk 5-6 hours per day, we mostly follow good forest paths; above the tree-line, the terrain varies from grassy uplands to rocky ridges, with some scrambling required for the peak ascents. A good level of fitness and experience is required to climb the peak and the guide reserves the right to make the final decision if we climb the final peak. Optional gratuities to the leader, guides and local staff. Transport from Athens or other towns to/from Litochoro. 1Litochoro & Walk to Shelter A - Spilios Agapitos, alt. 2,100 metres. Estimated Walking Time: approx. 3 hours. Arrive and meet your guide and rest of the group in Litochoro. Transfer to Prionia, from where we begin our hike, at an altitude of 1,100 meters. 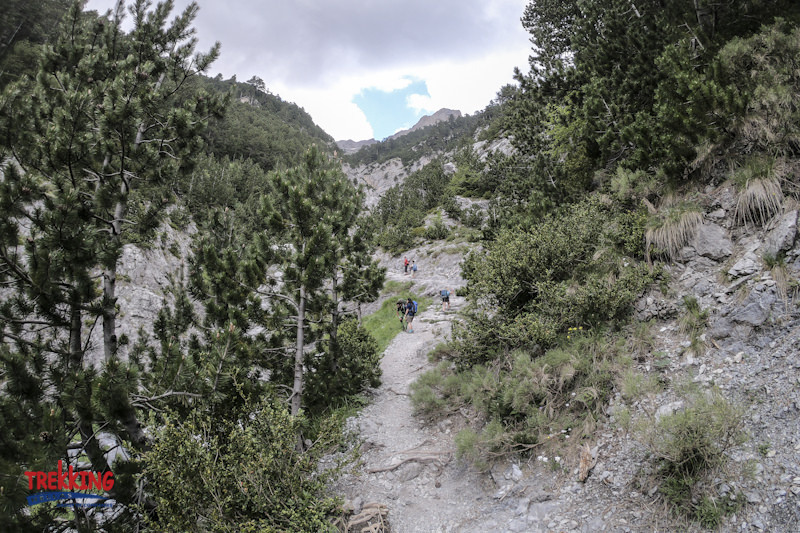 The route from Prionia to Spilios Agapitos Shelter is the most frequented hiking path on Mount Olympus and makes up a part of the E4. 2Peak ascents - Shelter Ch. Kakkalos, alt. 2,700 metres. Estimated Walking Time: 6 – 7 hours. From the shelter, a zig-zagging path brings us just under the mountains main summits. 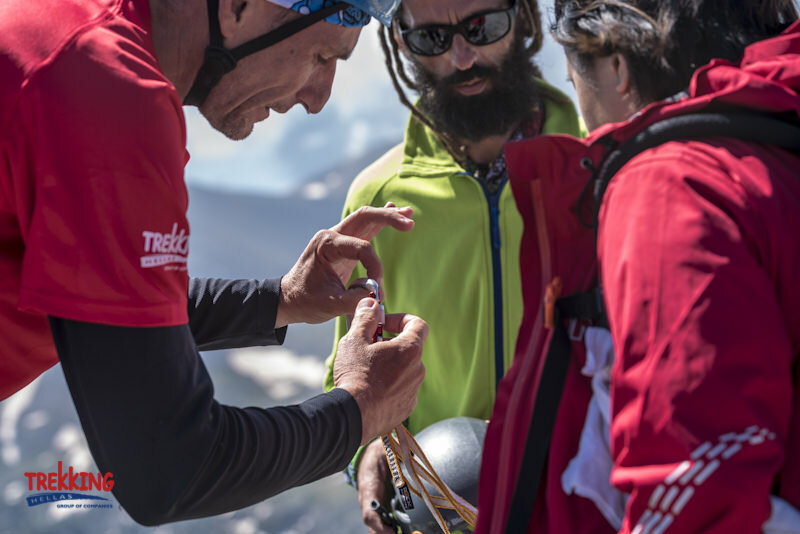 We either climb first Skala at 2,882 meters and then crossing a narrow ridge climb to the summit of Skolio at 2,911metres. 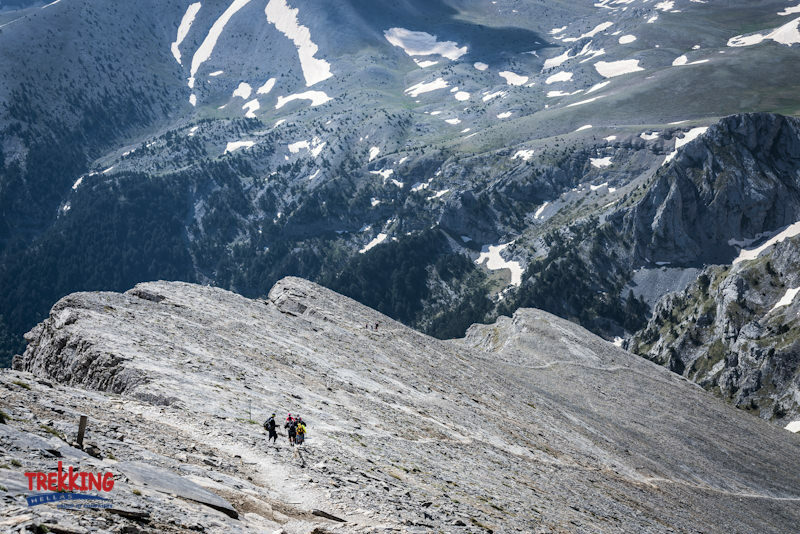 Or if weather permits and there is no snow, we ascent to the main summit – Mytikas (2,917metres), Greece’s highest peak, following a narrow gully (it involves about 1 km of scrambling). (4-5 hours walking on narrow paths: – some scrambling involved – altitude gain of 800 meters). 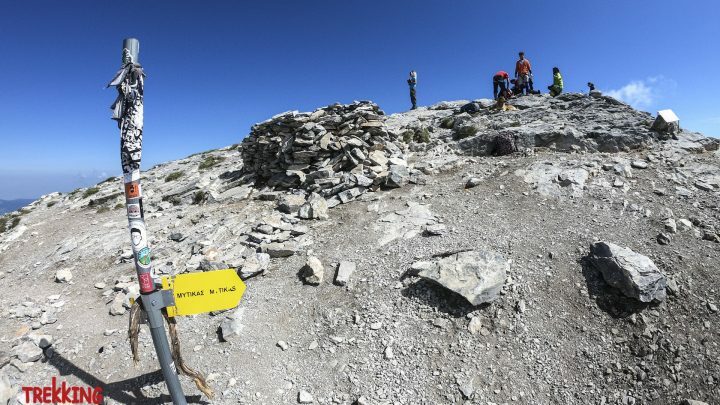 After reaching the summit we descend by the same way to the main path and crossing the spectacular precipice under the summit of Stefani – the throne of Zeus – we emerge to the alpine plateau of Mouses at an altitude of 2,700 meters where a small but friendly shelter will accommodate us (2-3 hours walking). 3Plateau of Muses - Petrostrougka Shelter alt 1,940 m. - Gkortsia. Estimated Walking Time: 5 – 6 hours. An easy day (if we did the highest peak yesterday). 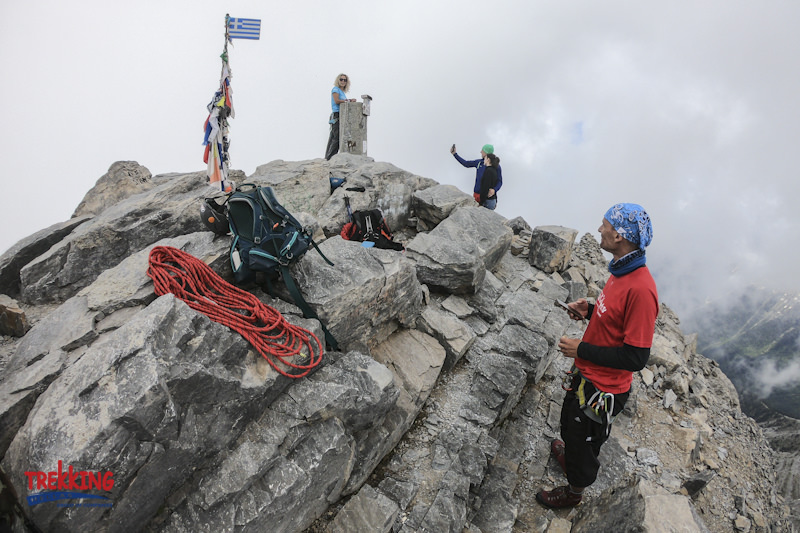 Before we start our descent, we climb a small peak – named Profitis Ilias – just above our shelter to admire superb views of Mt Olympus summits. We follow another path this time for our descent. In almost 2 hours we arrive in the shelter of the Hellenic rescue team (Petrostrougka at 1,940 m.) where we can have our lunch and relax before our final descent to our destination, Gkortsia (2 – 3 hrs walking) from where we transfer back to Litochoro. * Large, comfortable rucksack (65-85 liters) with padded straps and waist belt, internal frame preferred; waterproof liner recommended keeping clothing, etc. dry inside. * Sturdy, worn in trekking shoes. * Good waterproof top with hood. * Warm clothes, both for windy / cold daytime conditions and for the cool evenings (fleece tops or similar). * Shorts and long trousers for walking, preferably quick-drying material (cotton or poly-cotton not denim). * Sweatshirts or T-shirts for walking, at least one with long sleeves and collar (against sun-burn). * Sheet sleeping bag or similar (e.g. duvet cover), for the overnights in the shelter, although blankets will be available. * Sunglasses, towel, sun hat or cap, sun block. *Your own personal water bottle. As part of our environmental policy and actions, we are committed to eliminating the use of plastic water bottles. *Wash bag and simple first aid kit (plasters or blister kit, aspirin or similar, antiseptic). * Photographers: bring your cameras. * Torch (head torch if you have one). 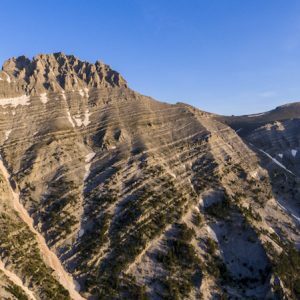 When are the best months to visit Mount Olympus? The total climbing season is between mid-June and late October. Sometimes, climbing season starts from mid-May, but this depends on last winter’s snow accumulation. 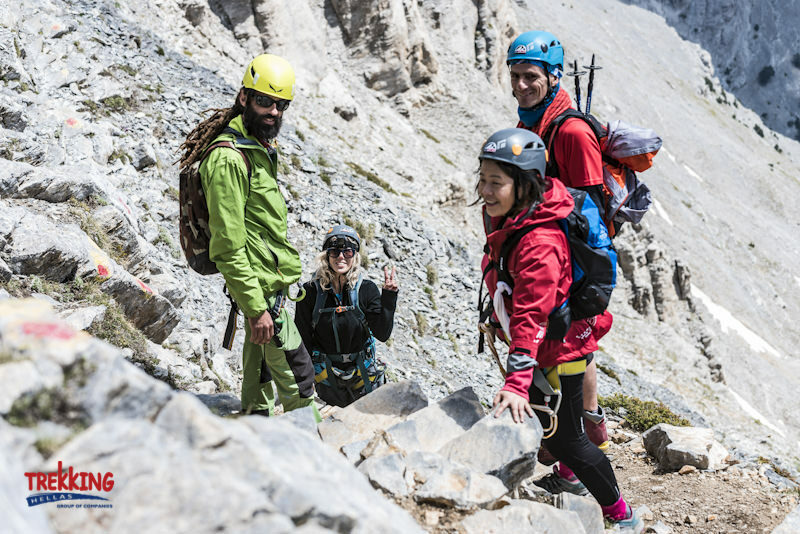 Best climbing weeks are early July and early September. Mid-July to late August is also a good period, however may be too warm and there is a high possibility of afternoon thunderstorms. What is the climate like during these good months? Maximum/minimum / average temperature? 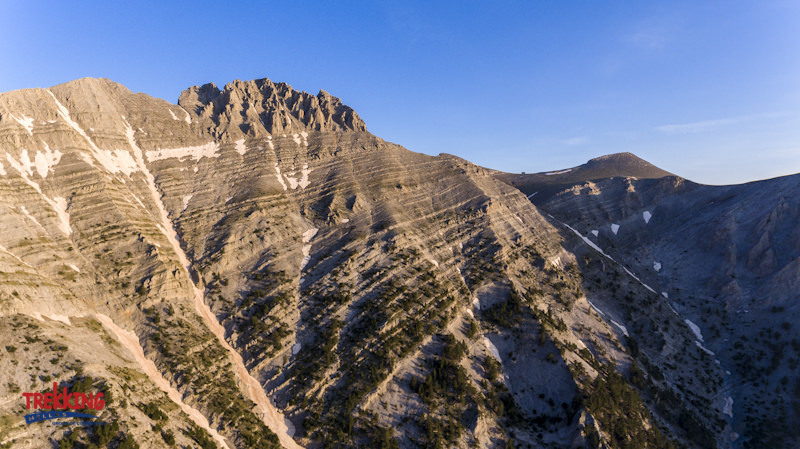 The weather conditions on Mt.Olympus are generally unpredictable and temperatures can vary widely. The local variations are the result of the impact of the sea and the rugged relief of the region. In the lower areas, (Litochoro and the foothills) the climate is typically Mediterranean, i.e. hot and dry in the summer, while humid and cold in the winter. Higher it is more humid and severe, with more intense phenomena. The temperature varies in the winter from -10°C to 10°C and in the summer from 0°C to 20°C, while winds are an almost everyday occurrence. Generally the temperature falls to 1°C per 200m of altitude. As the altitude rises, the phenomena are more intense and the variations of temperature and humidity are often sudden. The coastal northeast slopes of Olympus, receive more rain than the continental northwest, so, as a result, there is a clear difference in vegetation. In some places the winds gather snow, 8-10 meters thick, (‘anemosouria’ in Greek), while in some deep ravines the snow is maintained all over the year. However, during the climbing season (June to October) these snow patches do not affect hikers. The weather may change several times in the same day. In summer, rainfalls are frequent, commonly as evening thunderstorms, many times accompanied by hail and strong winds. How long and what elevation change we experience? Are there many steep sections? 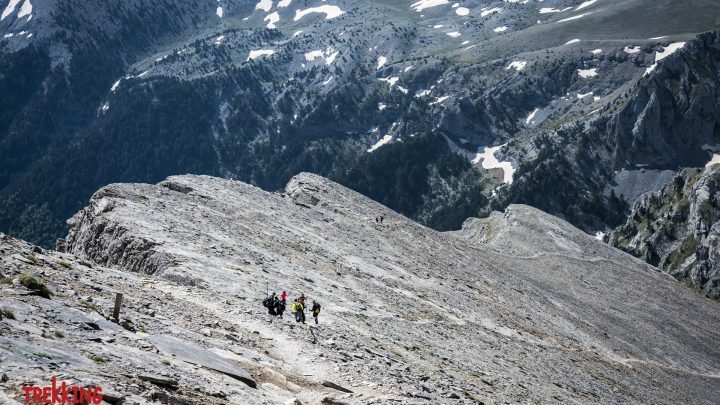 Except for the last 200 m. of vertical climb, involving the summit of Mytikas (2,919 m.), which is a UIAA level 2 technical scrambling/climbing route, the rest of the route is easy or medium difficulty hiking path. Ropes though not necessary, are being used for extra safety. The second highest summit, Skolio, (2,911 m.) is only 8 meters lower, has an equally amazing summit view, a summit log book, and can be reached by easy/medium difficulty hiking path, without any steep sections. Finally, on the hiking paths accessing the summits there are some sections of impressive drops next to the otherwise easy hiking path that could be scary for people with fear of heights, although they don’t pose any significant danger, as the path is relatively safe. 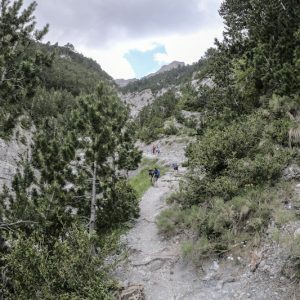 Do participants need rock climbing or scrambling experience for the climb of Mytikas? Scrambling experience is required if ascending to Mytikas is a must. It is not a pre requisite (eg. we don’t ask people before hand) but experience shows that people who don’t have the experience might not make it. Ropes though not necessary, are being used for added safety. 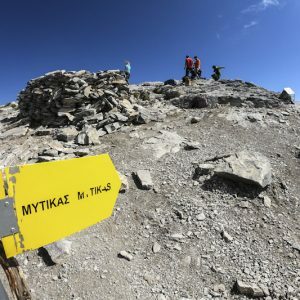 In case of groups, how many people will be roped together for the climb of Mytikas? Each guide can have 3-5 persons roped together (depending on weather conditions and experience level). But there is the option of climbing it in via-feratta style as well. 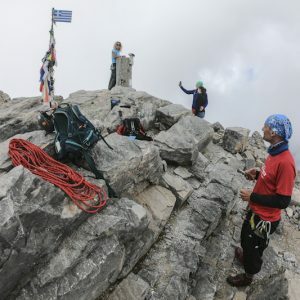 If a participant is not comfortable climbing Mytikas, is there somewhere safe they can wait for the group before the descent? 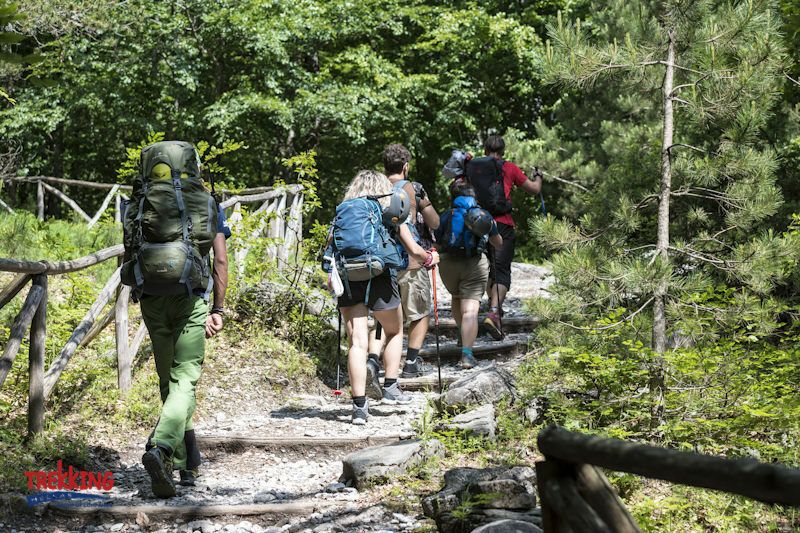 Will participants need to carry all of their own equipment, or are there porters? Travellers must carry all their equipment. There are no human porters available on the mountain. There is a mule caravan going up & down the shelters for the purpose of resupplying the Mountain Huts, and can load luggage at an additional charge. The caravan has specific times of arrival and departure from the Mountain Hut. It is also possible for mules to accompany the group on our specific timetable, but at a much higher additional charge, as this will involve the mule caravan following an additional, unplanned route. 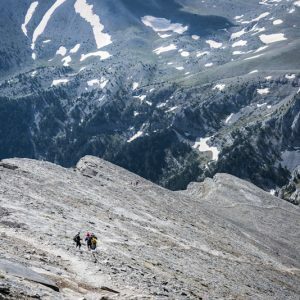 Certain sections of the mountain routes, like Zonaria path and Kofto path, connecting Shelter A’ with Kakkalos shelter, may not be physically accessible to mules. How challenging would you grade the trek out of 5? The trek of the mountain paths would be rated 2. 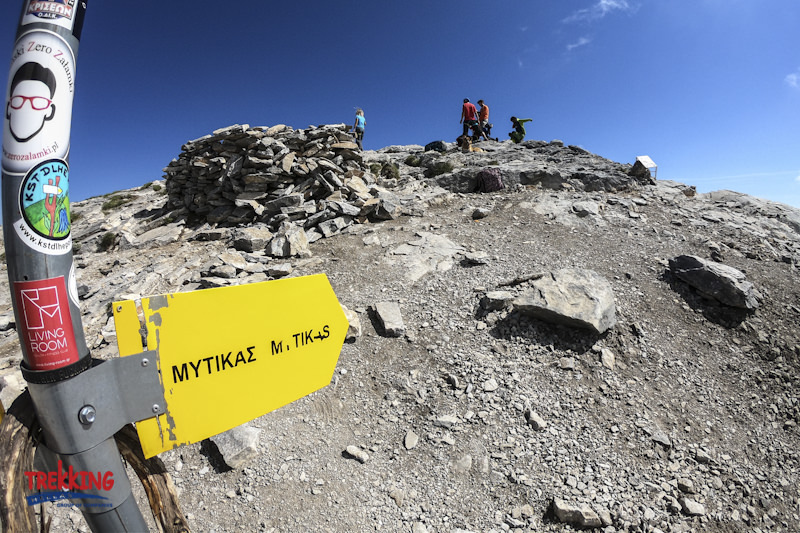 The last part, the climb for Mytikas peak would be rated 4. The alternative climb to Skolio Summit, would be rated 2. Is there mobile phone signal anywhere on the mountain? There is mobile signal on about 60% of the route. In some areas you need to get to a specific location to have signal. 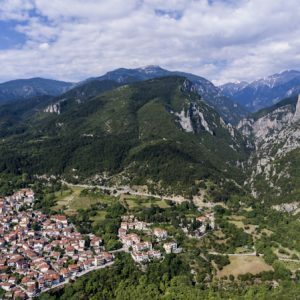 There is no phone signal inside Enipeas Canyon, on the Plateau of the Muses nor on sections of the route between Gkortsia and Petrostruga. In all mountain huts there are communal rooms with bank beds. You can also camp out of the mountain hut with your tent and use the mountain hut facilities. What is a typical menu for breakfast, lunch and dinner? Breakfast: bread, butter, marmalade, honey, cheese, coffee – tea – milk, Nutella. Dinner in Mt. Hut: sample menus: Soup, Pasta with sauce, Salad, Bread, cheese / Lentils with rice, Beef with pasta, rice or mashed potatoes, salad, bread, cheese / Soup, Sausage with pasta, rice or mashed potatoes, meat plate, salad, bread, cheese. Is bottled mineral water provided in the tours? Not in the price – bottled water is on sale in the Mountain Hut, rates 1-2€/bottle depending on size. How can travellers refill water bottles each day? There is a mountain spring on Prionia. There is also one mountain spring (with less water supply) 45 minutes hiking over Prionia. There are no other mountain springs close to the hiking routes so buying bottled water is the only option. Mountain huts have heating availability, either a fireplace or petrol heaters, but they are activated only when temperature falls below roughly 10 degrees Celsius. There are no clothes/boots drying facilities. Warm blankets are provided in all Mountain huts. No, there are no showers on the mountain huts. On Mountain Hut, depending on water availability, there are showers, but have snow-melt-water supply and temperature. Is there electricity at the Mountain Hut for people to charge cameras and other electric equipment? Mountain hut electricity is supplied by solar panels and generators, and is available for a few hours daily. Usually, electricity is available from dusk until about 10pm or 11pm, and sometimes from dawn and for a few hours. The plugs are limited so it is preferred to have extra chargers with you especially if being part of a big group. How much spending money will the travellers need to budget each day for drinks, snacks etc.? Drinks cost between 2€-4€, there is a big variety of hot drinks (tea, coffee etc) / soft drinks and alcohol (beer and wine). How much would you recommend they budget for tips for the guides? Mountain guide tipping is optional and can vary depending on the traveller’s satisfaction of the service provided. A usual tip is about 50 euro per day.